Interpretive panels explain what the place we call Kansas was like millions of years ago and how the topography, flora and fauna have changed over the course of history. 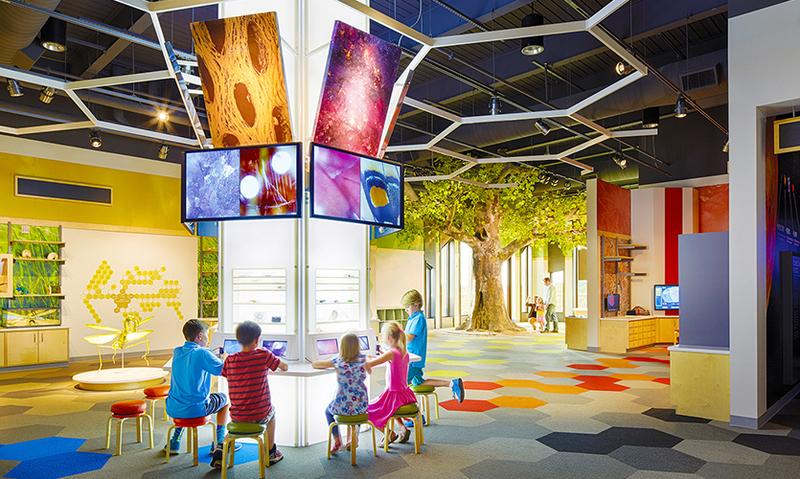 Educational programs developed by the museum and organized school field trips make the Discovery Room a popular destination. 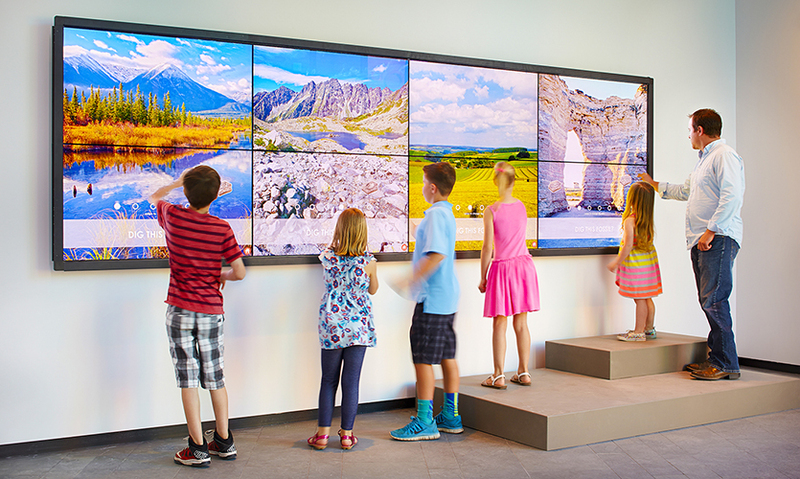 The permanent exhibits, while secondary, are high-tech, high-touch as well as STEM and kid-friendly. 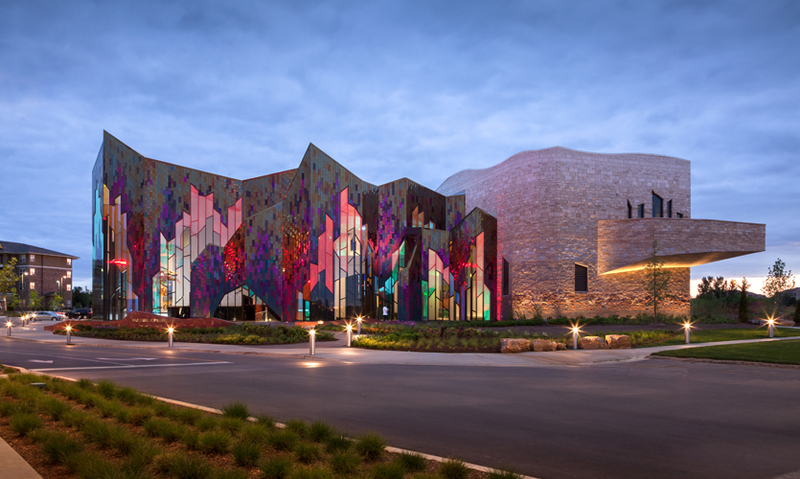 There remains a burning desire to know more about the Verner Johnson-designed Museum at Prairiefire (Overland, Kan.)—an example of how architecture and experiential graphics can be as one—and its permanent exhibits, designed and fabricated by Dimensional Innovations. For the uninitiated—especially in light of recent massive wildfires—the idea of intentionally setting a vast grassland ablaze seems dangerous and irresponsible, if not downright terrifying. Yet, in east-central Kansas, the ritual of the spring burns has been repeated for hundreds, perhaps thousands of years beginning with Native American practitioners; the man-made blazes are set to mimic natural fires caused by lightning. The “prescribed” fires can be seen for miles across the open prairies, including from the highways, which has drawn a following among tourists. It’s also an important practice for the agricultural community of Kansas: the controlled burning of grassland limits the spread of invasive species and pests in addition to producing more nutritious, lush grasses for livestock to feed on. 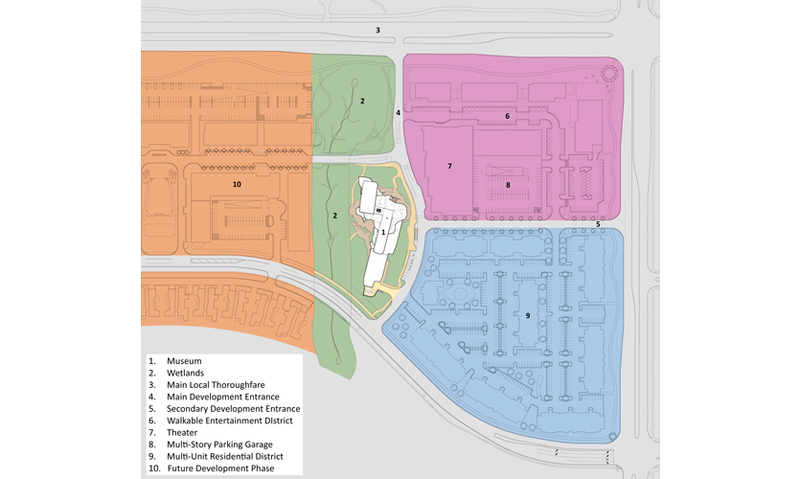 There is another “Prairiefire,” though: a 60-acre mixed-use development with residential, commercial and entertainment outside of Kansas City in Overland Park, Kansas that includes the LEED-Silver-certified Museum at Prairiefire designed by Verner Johnson, Inc. (Boston). 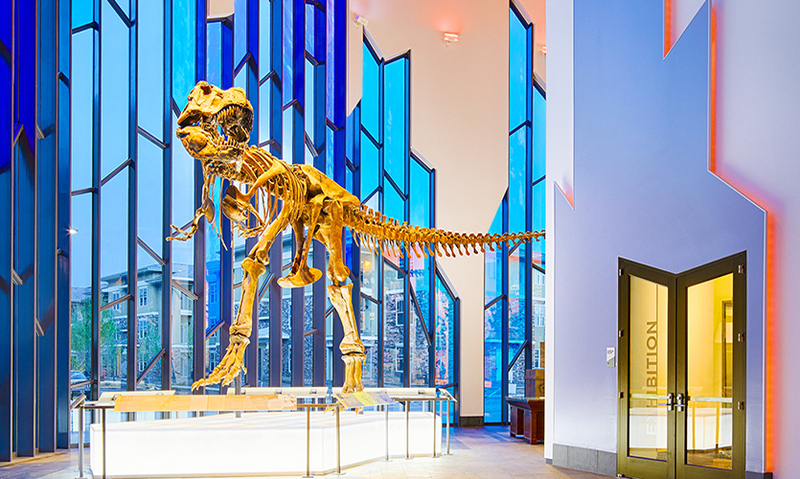 The museum was conceived by developer Merrill Companies, Inc., as a world-class educational and cultural attraction and the centerpiece of the development, with permanent exhibits and space to showcase travelling exhibitions, primarily from the American Museum of Natural History (New York). In the four years since opening, the museum has been a success on all fronts, most importantly in creating a sense of place and pride in its suburban community, proving that worthwhile cultural destinations can be located outside of city centers. To the northeast, is the dense Entertainment District but to the southeast, it faces multi-family residences and large villas to the south. 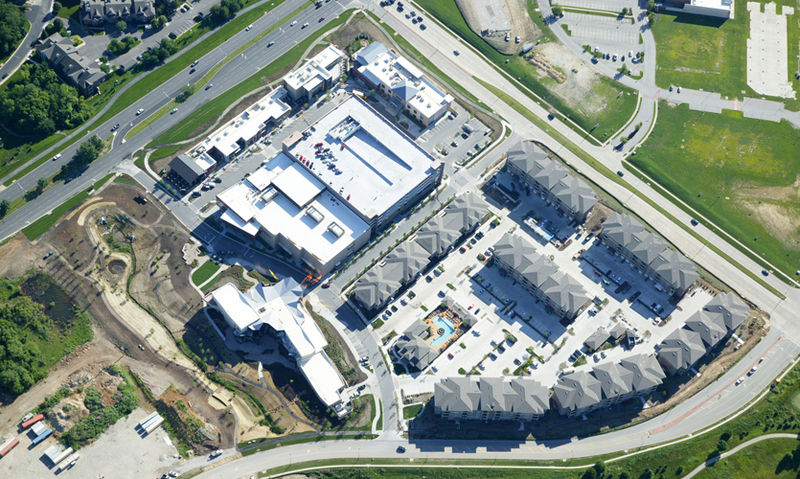 To the north and west, the building is part of the Wetlands park with outdoor activity space in the form of low-walled stepping terraces that form a transition between the building and the park. The terraces can be used for events and performance space with the building or the Wetlands as backdrop. The most prominent stone façade is the north, which at an open distance faces the main thoroughfare through Overland Park. 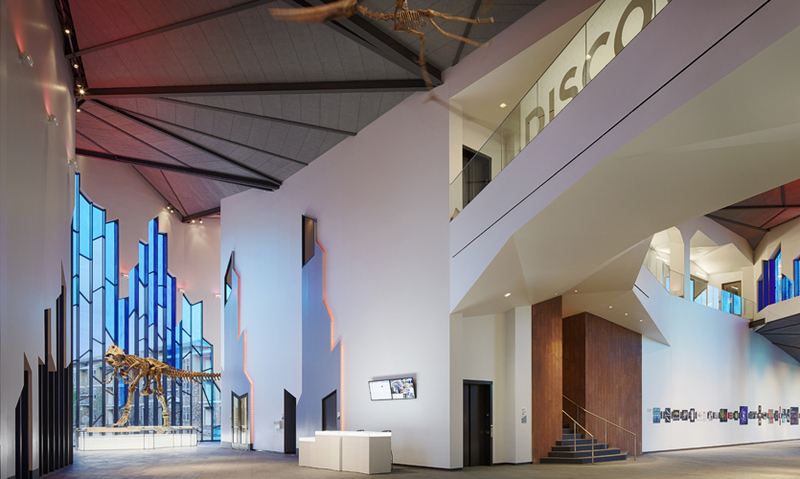 The interior is as captivating as the façade, as forms evocative of the fire concept are presented at every scale and through every material, from the slate and tile flooring, to the sloped doors and windows, to the billowing grey tectum ceiling panels. 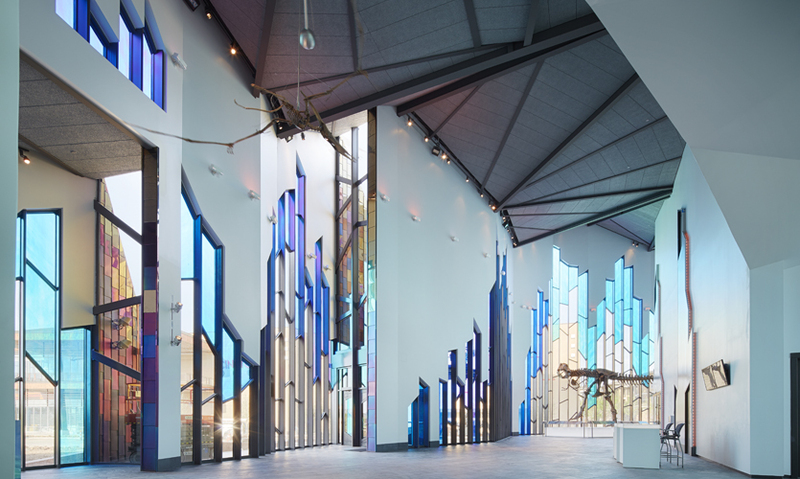 The flame shapes of the exterior glazing are just as present on the interior of the lofty space, but as seen from inside, the colors are cool-toned and blue—a respite from the heat or, perhaps, the hottest part of the flame. Meanwhile, smoky-toned wood feature walls become pooling smoke-like forms at the ceiling. All of the museum’s public spaces were designed to be just as engaging as the exterior, not only architecturally, but also programmatically. 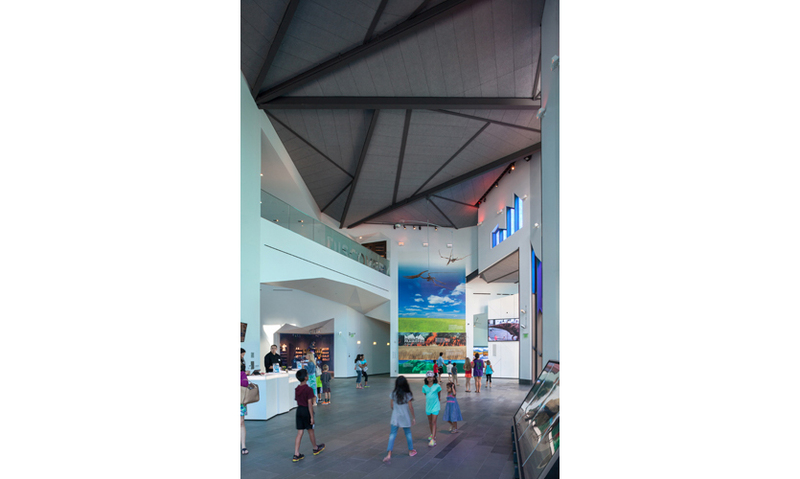 Contrary to the design of most museums, at Prairiefire, the main exhibit area is for traveling exhibitions, a condition that heightens the need for the building and permanent exhibits to entice visitors. 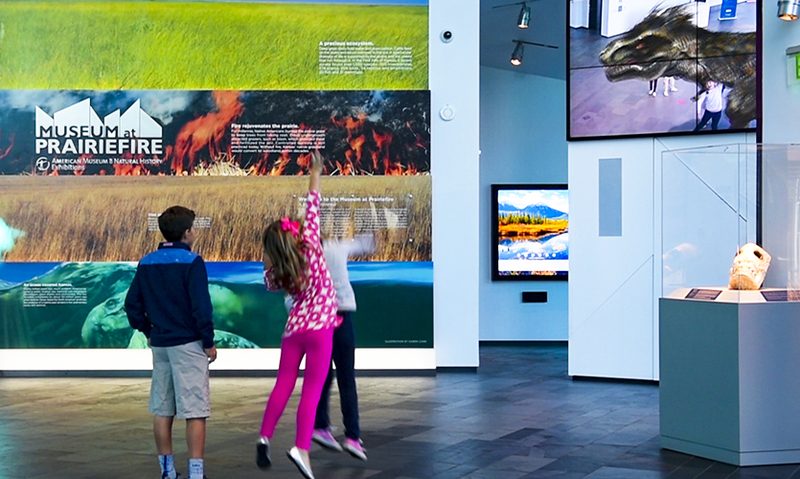 The permanent exhibits, while secondary, are high-tech, high-touch as well as STEM and kid-friendly. with it at the same time, digging up virtual fossils and building their very own dinosaur. Using a 3D game engine, visitors navigate through a series of questions and activities, before sending their fully-rendered 3D creation to another camera-enabled screen, where friends and visitors can interact with the fun creatures. The exhibit ties to the region and land, just as the building does—interpretive panels explain what the place we call Kansas was like millions of years ago and how the topography, flora and fauna have changed over the course of history. 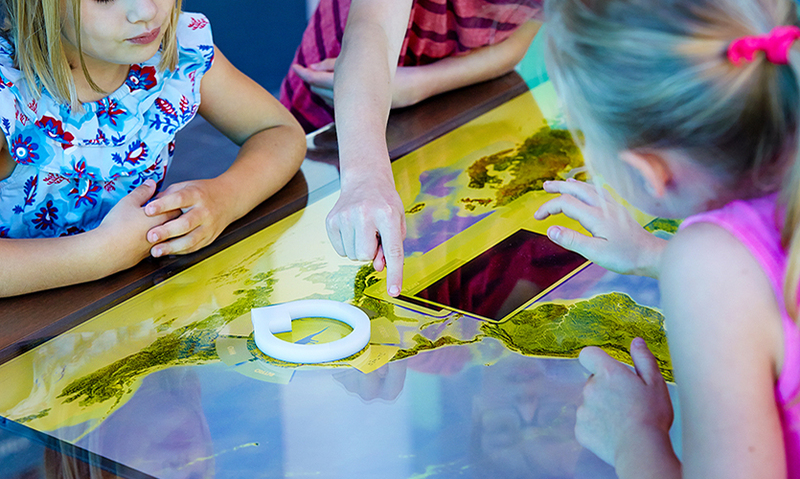 On the second floor, there is another permanent, hands-on educational area for children, which is the second largest program area in the museum—the Discovery Room. Six principal areas of science are explored through interactive learning and demonstrations: Paleontology, Anthropology, Invertebrate Zoology, Field Biology, Geology and Astronomy. 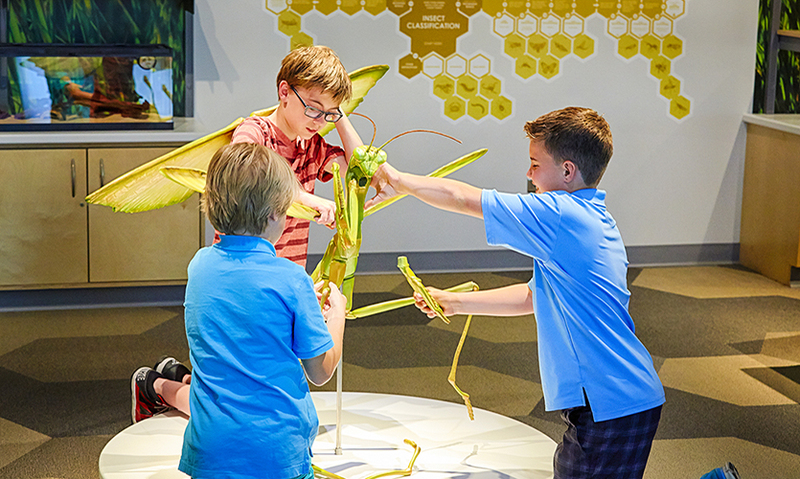 Educational programs developed by the museum and organized school field trips make the Discovery Room a popular destination. 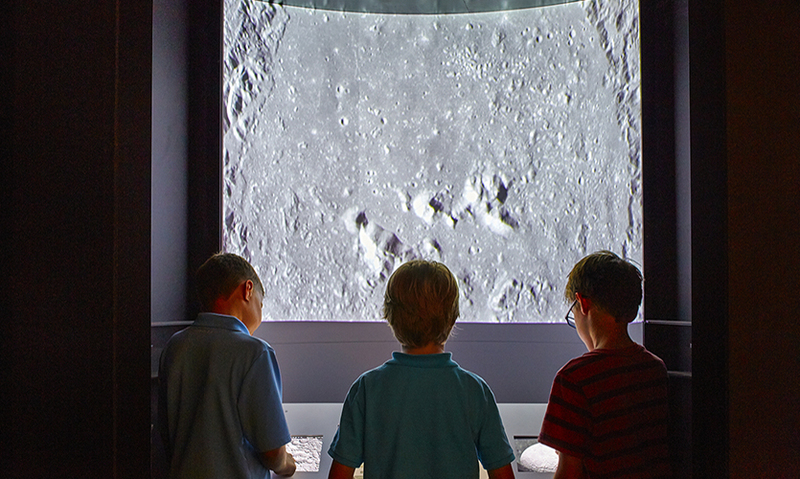 The Discovery room houses an innovative interactive called the “WorldWide Telescope,” developed in collaboration with AMNH, WorldWide Telescope, Dimensional Innovations developed a 3-D projection pod that gave visitors access to virtually travel from Earth, through the solar system and even outside of the solar system using live-updated photogrammetry from NASA. The museum is singular in its approach for many reasons, none the least of which is its origin: Philanthropic and savvy Merrill Companies executives wanted to both elevate the idea of the suburban mixed-use development and make use of the Kansas STAR Bond program, which allows municipalities to issue bonds to finance the development of major tourism, commercial and entertainment areas and use the sales tax revenue generated by the development to pay them off. Merrill had made contact with ANHM and had worked with local students to develop ideas for the space before hiring an architecture firm. The first firm didn’t pan out but working with Verner Johnson on the recommendation of their construction management firm, did. 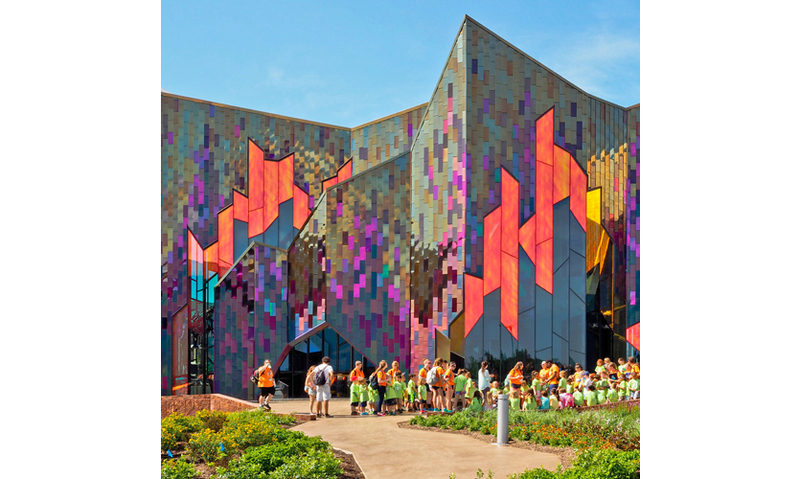 “Creating a museum was a one-time endeavor for them, and they wanted to make sure that they themselves as well as the greater community would be proud of it,” explains Jonathan Kharfen, principal at Verner Johnson. 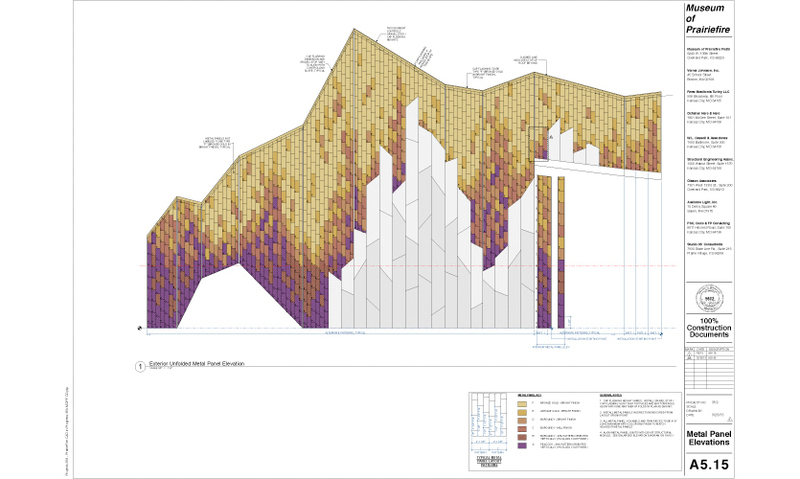 “I felt that the client was looking for a design more specific to the region and developed design concept options based on the notion of storytelling.” The idea of evoking prairie fires was especially particular to the area and would resonate not only with the client, but also with the regional community. It was such a strong a concept that Kharfen’s team approached all aspects of the design through its lens, creating a building that embodies a kind of experiential graphic design in and of itself. 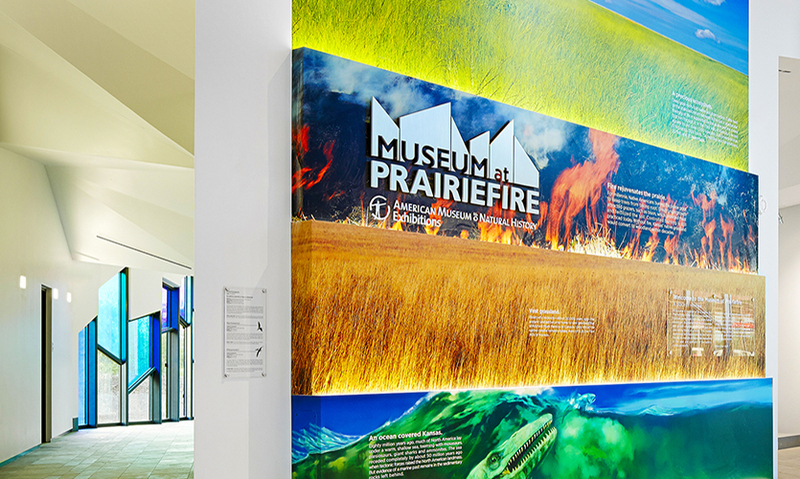 From siting to massing, forms, materials and detailing, all design decisions cultivate the concept of prairie fire—even down to how the “fire” walls overlap, reminiscent of how actual prairie fires were originally set by horses dragging a torch in a line. 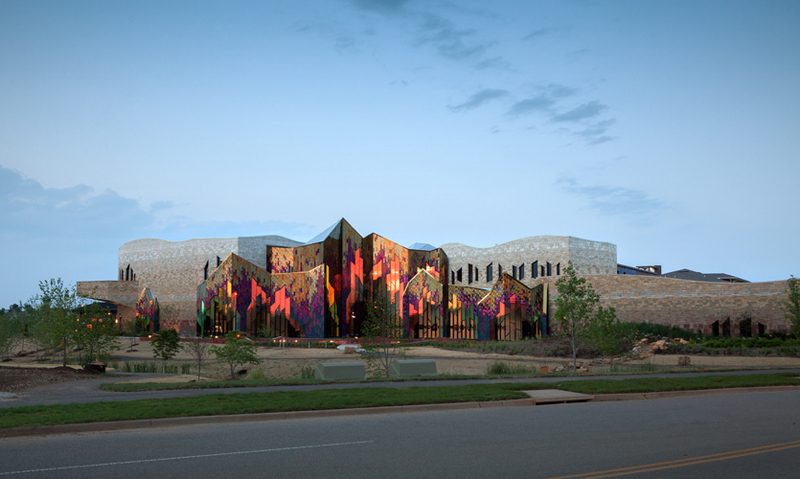 The most obvious reference to a blaze is the shimmering glass façade that instantaneously engages viewers. 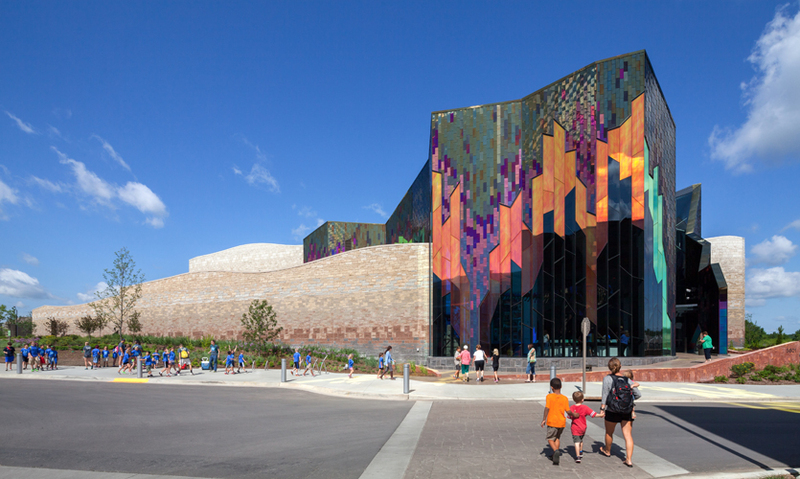 The insulating dichroic glass was developed specifically for this project and is the first known application of its kind in North America; Kharfen says the project hinged on the clients having confidence in the team’s vision, as there was no example to point to in existence. Their level of support and faith in the result, he says, was rare—and welcome. 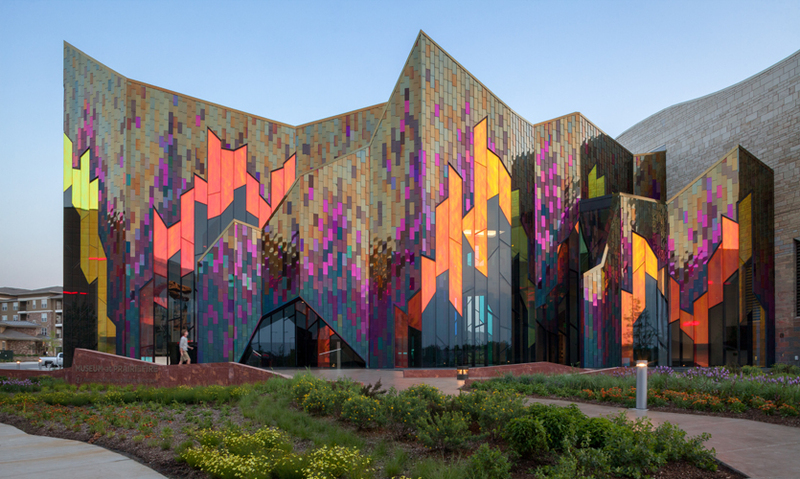 “A thin 3M dichroic film was used as an interlayer in laminated glass as the outer lite, with low-E coated performance glazing as the interior lite,” Kharfen says. “The lively effects of the film are phenomenal, and shift in color depending on the viewing angle, both horizontally and vertically.” The rippled, mirrored effect demonstrates light and dark streaks throughout, enhancing the painterly, flame-like appearance. Light Interference Color stainless steel panels were also used, which slightly shift in color depending on viewing angle. Four different base colors were used in three different finishes to achieve a gradient flame effect, from blue-purple at the base, through reds, to gold hues at the top. 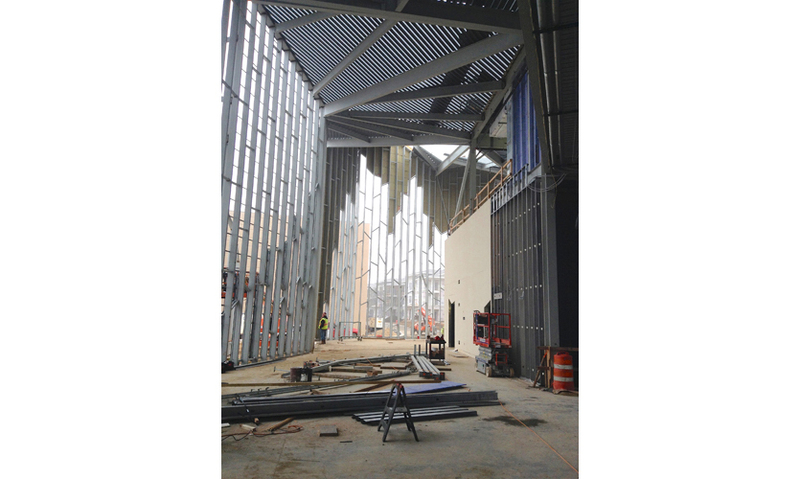 Over 10,000 individual panels were used in a standard flat-seam application to create the walls. 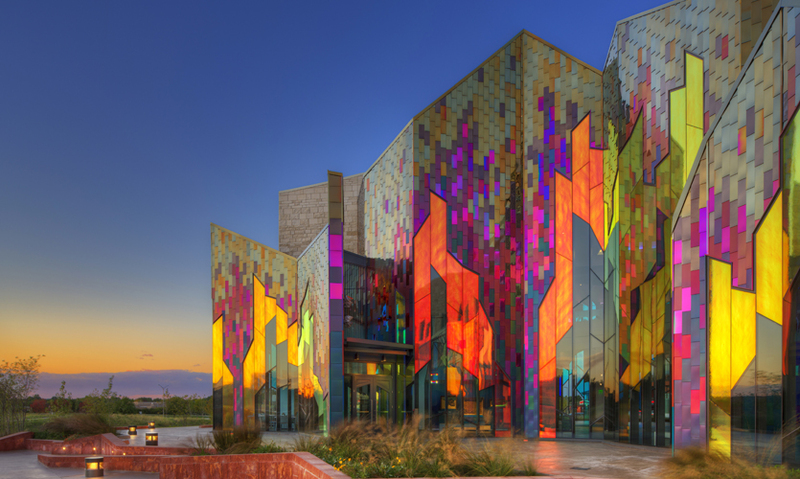 The use of specialized materials came with a need for extra care to be taken: Kharfen’s team worked with Goldray Industries to develop the dichroic glass product specifically for the museum in addition to working closely with manufacturers and subcontractors on elements such as the lobby structure and rotating mullions to ensure the most durable long-term solution without compromising the design. 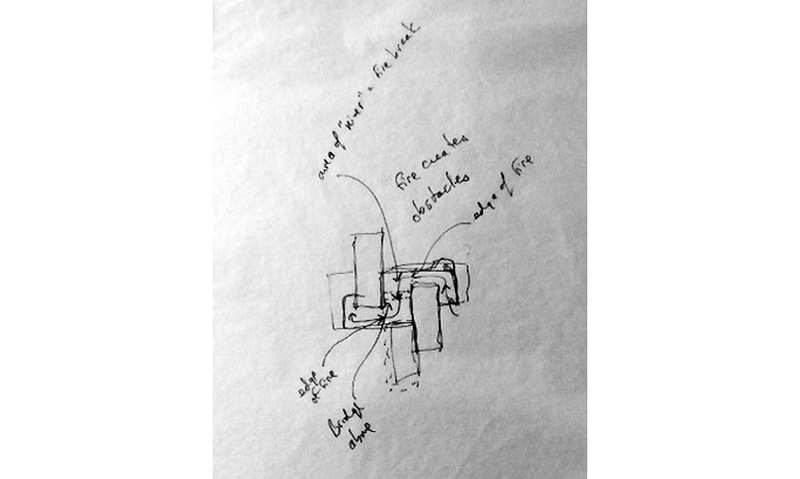 Between the Verner Johnson and McCown Gordon, the entire process was well managed—the project stayed on budget and through a value-engineering round, the design was uncompromised. The meetings were comprised not only of graphic and industrial designers, but also experts, scientists, copywriters—everyone in the room at the same time—so they could ensure they were telling an accurate story, within the timeframe and budget. 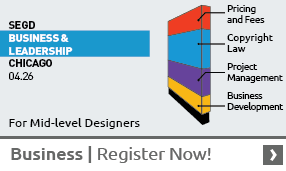 Part of the large Dimensional Innovations team was their technology division, which includes software developers, coders, graphic and user interface designers and was intentionally built to address the needs and expectations of implementing high-tech solutions to benefit storytelling. 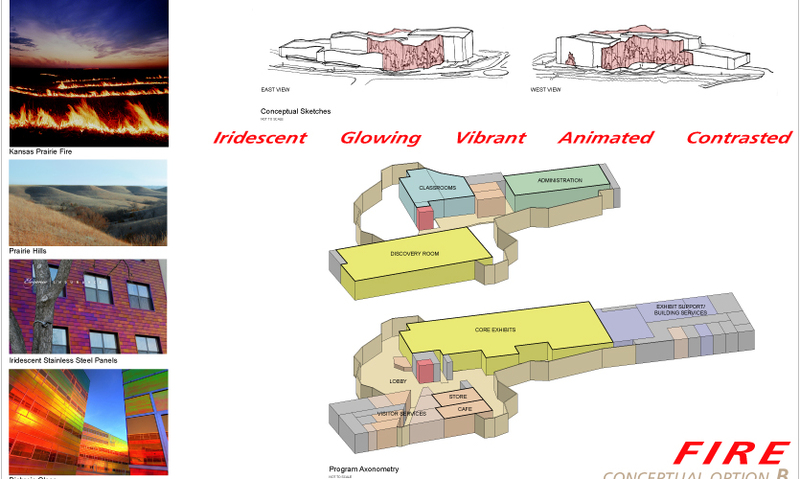 “Anytime we do a museum, we push the envelope of our capabilities,” remarks Hendricks of the project. “We hadn’t seen augmented reality used in that way before, so it opened us up to thinking about using it in other ways on other projects.” He says what the team developed for Prairiefire has evolved into what they’re working with on projects today, and that experience has been invaluable.